FILE - U.S. Secretary of State Mike Pompeo speaks during a news conference following a meeting with North Korea's envoy Kim Yong Chol in New York, May 31, 2018. U.S. Secretary of State Mike Pompeo is expected to discuss U.S.-Russia relations, including President Donald Trump's meeting last week with Russian President Vladimir Putin, as he testifies Wednesday before the Senate Foreign Relations Committee. Ahead of the session, Pompeo on Tuesday defended the talks in Helsinki as "incredibly important" and said he thinks the world will benefit from the discussion. At the summit, Trump appeared to embrace Putin's denial that Russia had interfered in the 2016 U.S. election and equated Putin's statement with the U.S. intelligence finding that it had meddled. Putin said at a news conference he wanted Trump to win. Trump's comments drew sharp criticism, and after returning to Washington he said he supported his intelligence officials and their conclusion, often coupling it with his oft-repeated statement that his campaign did not collude with the Russians and that the Russian interference had no effect on the outcome of the election. By Sunday, however, he blamed former President Barack Obama for not stopping the Russian interference in the election, yet called it "all a big hoax." A new Quinnipiac University poll said Americans believe, by a 51 to 35 percent margin, "that the Russian government has compromising information about President Trump." The survey said that U.S. voters, by a 52-27 percent margin, believe the summit was a failure for the United States, while those polled, by a 73-8 percent edge, believe it was a success for Russia. Top U.S. intelligence officials say Russia is again attempting to interfere in the U.S. electoral process in the November voting, although Trump administration officials have vowed to try to stop it. The Quinnipiac poll said 63 percent of voters are "very concerned" or "somewhat concerned" about Russian interference in the upcoming vote. President Donald Trump walks off after speaking to the Veterans of Foreign Wars of the United States National Convention, July 24, 2018, in Kansas City, Mo. 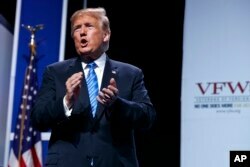 Trump said Tuesday that Russia "will be pushing very hard for the Democrats" in November's congressional elections, against his favored Republican candidates. The U.S. leader said on Twitter that he was "very concerned that Russia will be fighting very hard to have an impact on the upcoming Election." Trump claimed that "based on the fact that no President has been tougher on Russia than me, they will be pushing very hard for the Democrats. They definitely don’t want Trump!" Trump's contention that Moscow would favor Democrats in the November 6 congressional contests — when the entire 435-member House of Representatives and a third of the Senate is up for election — is at odds with the U.S. intelligence community's conclusion that Russia meddled in the 2016 presidential election to help Trump win the White House. Republicans now hold majorities in both chambers of Congress, but U.S. political analysts say Democrats could wrest control of one or both houses, more likely the House. Democrats need to pick up two seats to claim the Senate majority and 23 to control the House when the new Congress takes office in January. Even with control now, Republicans have had difficulty approving Trump's legislative agenda and likely would have even more trouble should Democrats take over one or both houses. If Democrats assume control of the House, Trump opponents could start numerous investigations of his administration and open impeachment hearings to remove him from office. Special Counsel Robert Mueller is continuing his criminal investigation of Russian meddling in the 2016 election, probing whether the Trump campaign colluded with Moscow. Mueller recently indicted 12 Russian military intelligence officials for hacking into the computer files of Democratic operatives supporting Trump's challenger, Democrat Hillary Clinton.